Saisons are very ‘on-trend’ at the moment – every craft brewery worth its salt seems to brew one, just as last year they all had to brew lager. So it was inevitable, perhaps, that one would show up in this collection. That said, I hadn’t expected Marble to be the folk to do it; in my mind, they’re at the more traditional end of the craft spectrum. To be fair to them, though, their ‘core range’ appears to have exploded into just about every beer style on the planet since I last looked seriously at them. Saison itself is a style I struggle with; it’s a word that defies definition almost as effectively as ‘craft’ and as such ends up being about as much use. It’s probably pale, usually dry, often spicy and commonly a little sour but that’s about as firmly pinned down as you can realistically get the style. 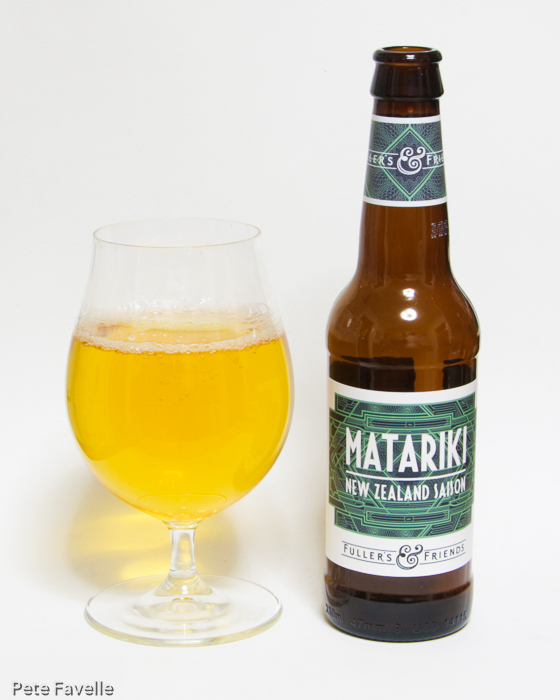 Matariki is a 5.8% ABV New Zealand saison, in that it’s a saison made with New Zealand hops. It’s a bright golden ale, with a fleeting head and a lot of large, rising bubbles suggesting some fairly heavy carbonation. The aroma is complex; spicy, with a sharp, acidic edge of citrus pith and beneath that, a little tropical blossom from the Kiwi hops. In the mouth it’s foamy from all that carbonation. There’s an initial sugary sweetness which gives way to lots of tropical fruit flavours. That swiftly leads into an acidic dryness to wash away the sweetness, along with some delicate spice. There’s a lovely, crisp bitterness at the very end, that leaves you reaching for the next sip. I don’t think I’m any closer to understanding saisons as a style, but this beer is delicious and refreshing. 4 stars.